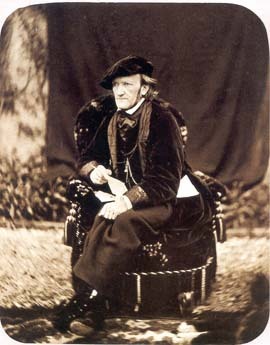 Richard Wagner (1813 - 1883) is the greatest composer since Beethoven. He is also probably the most misunderstood composer who ever lived. In seeking opinions either about the man, or his music, usually you will find either pure adulation, or absolute disgust. Even when he lived, Wagner was hated by a great many people, the object of scorn and ridicule mostly because of what was written about him. From the very first bars the soul of the pious wanderer who is awaiting the holy vessel plunges into an infinity of space. Little by little there forms before his eyes a strange vision that takes a body and a face. The vision becomes clearer, and the miraculous host of angels passes before him, baring the holy cup in their midst. The sacred procession draws nearer. The heart of the elect of God gradually stirs. It swells, it expands, ineffable yearnings awaken within him. He yields to a growing feeling of bliss as the radiant vision comes ever closer, and when at last the Holy Grail itself appears in the midst of the secret procession, he is swallowed up in a ecstasy of adoration, as if the whole world had suddenly disappeared. Meanwhile the Holy Grail pours its blessings upon the saint in prayer, consecrating him a knight. Then the burning flames gradually mitigate their brilliance; in holy joy, the angelic host smiling upon the earth that they are leaving, returns to the heavenly heights. They have left the Holy Grail in the care of pure man, into whose hearts the divine essence has flowed, and the majestic company vanishes into the infinities of space in the same way that it first appeared. Read the experience by someone who waited 8 years to get a ticket to watch a butchered production of a Wagner opera.